Get that ball out of the deep stuff with the help of some tricks. Playing golf is not always about hitting great shots and sinking memorable putts. All golfers, including Tiger Woods, find themselves in trouble on the course from time to time. 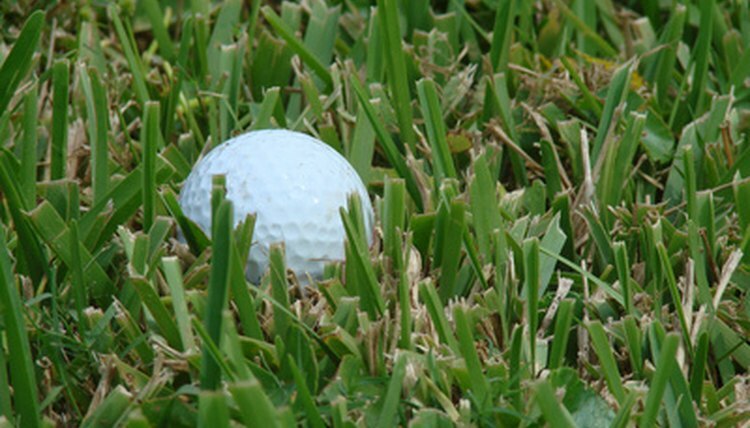 One of the most troublesome spots is thick rough, which can trap the club and keep the ball from flying. Recognize thick rough and how it can stop your club from following through. When you hit the ball out of the fairway and into the rough, your club will not be able to travel as quickly and the ball will not be able to go as far. Choose a club that is appropriate to the lie. A lofted iron or a hybrid club will work in most rough situations, but if the ball is buried deep in the grass, you might have to use a wedge to simply hack the ball into the fairway. Aim left if you are in the right-hand rough and you are a right-handed golfer. Despite your best efforts, the ball will not stay on your club face as long as it would if you were hitting from the fairway. Compensate by aiming more to the left than you normally would. The ball will tend to go to the right. Complete your swing. The rough will tend to grab your club head, so make sure you have enough momentum so that you can follow through.